What’s been happening with AGENCY? I get asked that question frequently. The good news is “A lot!” What’s not so good is that I haven’t been doing a good job of sharing that information out. That’s mostly been because we haven’t had a decent website for quite a while. (My bad!) With that little obstacle out of the way, I’m hoping to get the information flowing. Sorry to disappoint you, but that’s going to take a while and isn’t going to be covered in this one post. There’s just too much to cover! More organizations are using AGENCY now. We’re currently up to around 18, with a few more in the wings. Much of that growth has come from Recovery Cafe, which now has multiple members of the Recovery Cafe Network using AGENCY. That’s been quite an interesting experiment and development process. They are all using one shared version of AGENCY, with access by site segmented on the database level with Row Level Security. We also had to go back and make AGENCY timezone-aware. 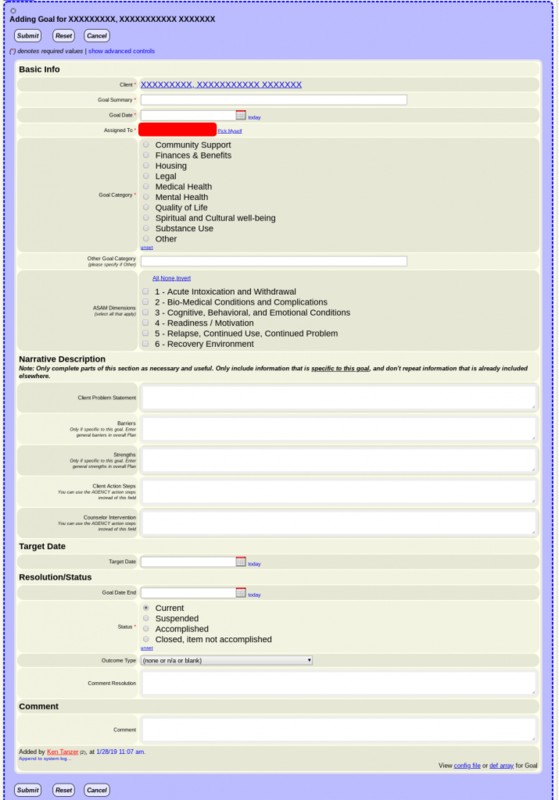 Individualized Service Plans are in the testing stage at REACH. Other organizations are already using Goals. REACH is taking this a step further, by adding an overall Plan to go with it. The new Plans also add optional Action Steps, and have a nice snazzy printable template. Plans have been a big missing piece in AGENCY–lots of information about people’s background and the services delivered, but not so much about why they are there and what they and staff are working towards! Pivot Tables with dynamic crosstabs and charts were added to reports just over a year ago. 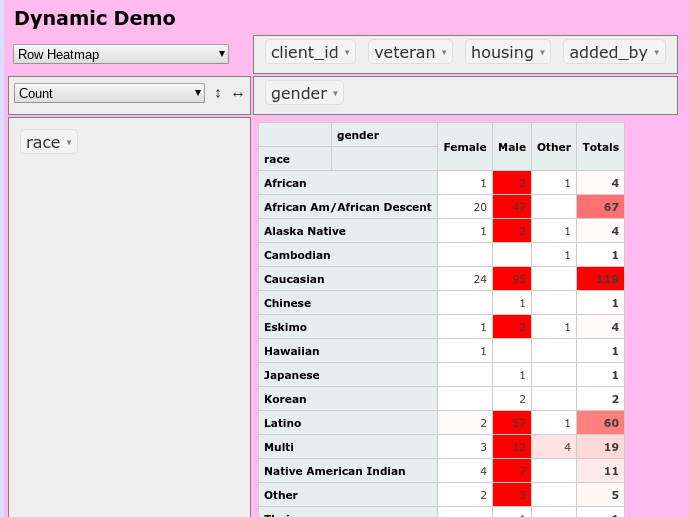 They provide some nice ability to do open-ended data analysis, as well as drill down into the data. There is still more work to be done on this. The code and templates used for creating spreadsheets and office documents has gotten some love and attention recently. 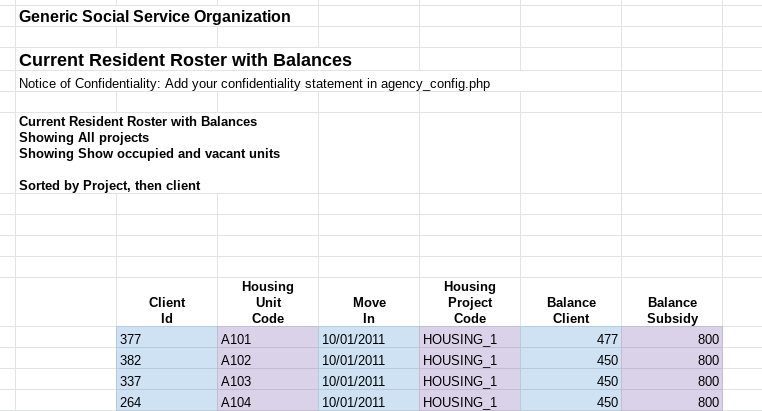 Most notably, the generic spreadsheet for AGENCY reports was significantly improved. Numbers come out as numbers instead of strings, the formatting is better, and it is now in Microsoft XLSX file, rather than OpenDocument ODS. More improvements to come! Well that is just going to have to do for now. Some of these items will hopefully get their own posts with more detail and elaboration. There are other topics to cover too. So stay tuned for updates, or put in a comment about what you’d like to read about!